Less than two weeks after Algerian President Abdelaziz Bouteflika stepped down, hundreds of thousands of protesters demonstrated in the streets Friday calling for the resignation of interim leader Abdelkader Bensalah. Along with Bensalah, the protesters called for all political elites, including Algeria’s military leadership, to end their hold on the North African nation’s power. Clashes broke out between the demonstrators and police, with officers firing tear canisters toward the crowd, witnesses told The Washington Post. 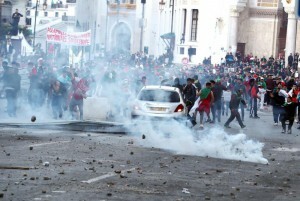 But the state-owned Algeria Press Service said the demonstrations were largely peaceful through the capital of Algiers. Protests first erupted after President Bouteflika’s announcement in late February that he would be running for a fifth term. The 82-year-old Bouteflika, who had held tight to the reigns of his country since 1999, resigned April 2, after Algeria’s army chief said it would pursue a constitutional procedure to declare the ailing president unfit to rule. Despite Bouteflika’s resignation, protests persisted as the public worried the country’s rule would only shift to another member of the same regime, and Bensalah’s appointment did little to assuage those concerns as he had served as speaker of the council under Bouteflika. The crowds chanted “No to Bensalah” or “Go out, Gaid Salah,” a reference to Gen. Ahmed Gaid Salah, the army’s chief of staff.